I recently read an article called ‘You should have asked’ translated from the famous French comic artist Emma’s ‘Fallait demander’. It brilliantly put words to a problem I knew I had but had never been able to articulate. It also explained why as a mother I always felt like I had a million and one things to do but never felt really on top of anything. Like that forever-exploding pile of unfolded washing. Or the dress-up costume I forgot to organise for my son’s book week event. I constantly felt a bit overwhelmed by all the things I was supposed to be doing to keep everything rolling smoothly at home. I felt like I was struggling to keep my head above water most of the time. Emma nails the reason why being a mother is so exhausting by perfectly describing the gender wars of household chores that many families experience. 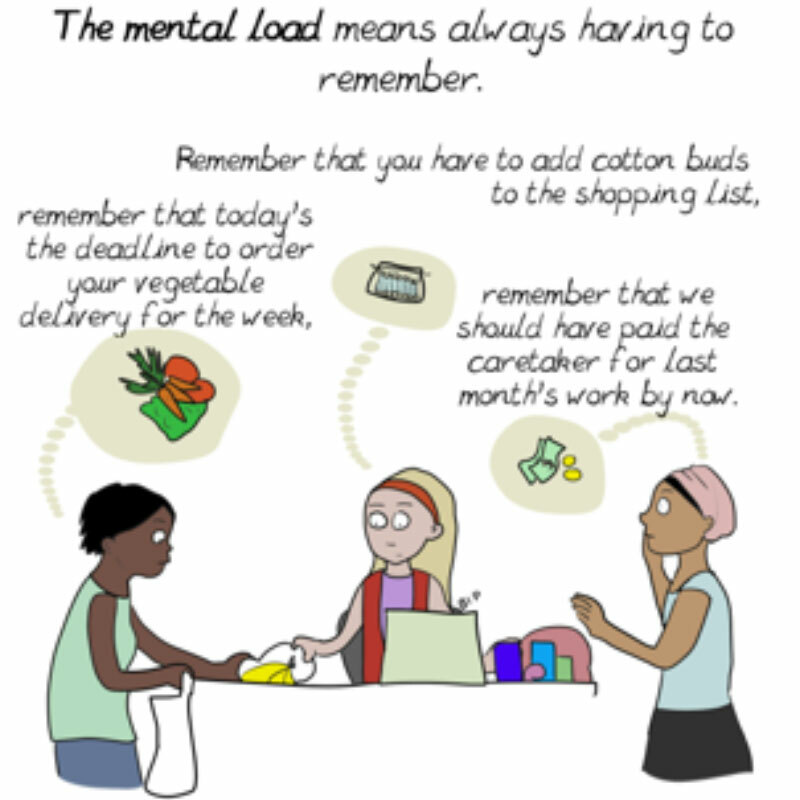 Her illustrations cleverly demonstrate the burden of the “mental load” many women take on in a household. To Emma, the impact of the burden falls in one place only. Although this is a French article, the statistics from the 2016 Census show the same scenario playing out in Australia. The typical Australian woman spend between five and 14 hours a week doing unpaid domestic housework, while for men it’s typically less than five hours a week. It’s not that our partners don’t help. They feed the kids, change nappies and participate in household chores. But it’s just not the same as the burden most women carry every day, which is that exhausting mental load, the overwhelming responsibility of being in charge of everything in the household. I did feel better after reading ‘You should’ve asked’ because it put into words something that I have experienced yet could not articulate. Part of me is also sad that women are still unconsciously assuming this role and that we still have a long way to go. I’m also none the wiser about what we do about it. I guess the first step is being aware of it. And then looking after ourselves and trying to share the load as much as possible. Written by Kate Pollard, Co-founder of Circle In.